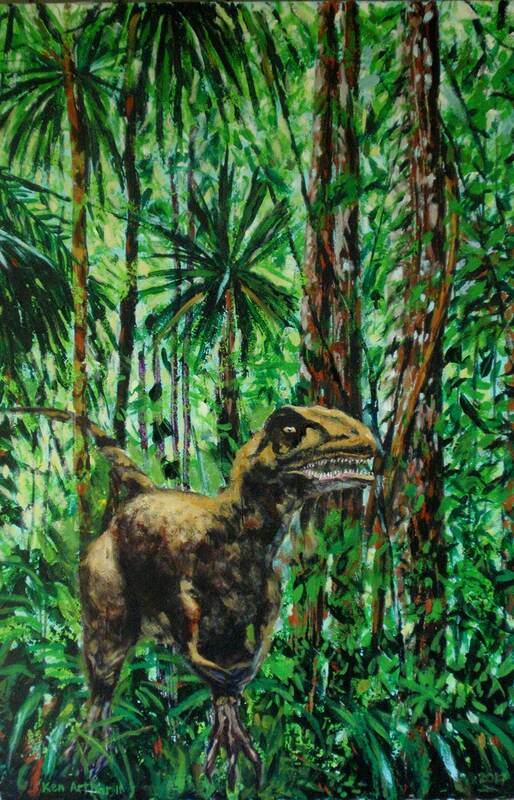 "A Walk in the Jungle" by Texas artist, Ken Arthur, brings the prehistoric world home with this original dinosaur painting of an Eustreptosponoylus! Awesome dinosaur wall decor and dinosaur wall art perfect for dinosaur fans or boys room decor! One of a kind professional dinosaur fine art that will always spark wonder and imagination in the dinosaur fans of your household for years to come! The Eustreptosponoylus is from the middle Jurassic period. 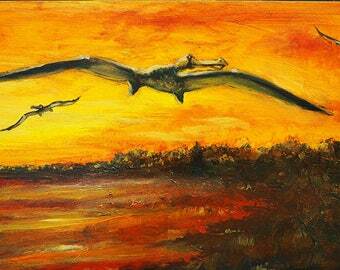 It had powerful legs and arms which enabled it to catch smaller dinosaurs, fish, and other reptiles to eat. 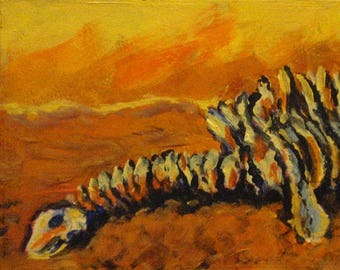 This original painting is an acrylic and enamel on board and would be great for dinosaur art & dinosaur wall decor fans. 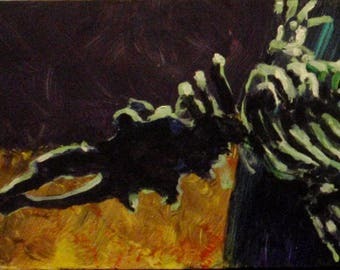 -Several years back, I had painted a series of trees, growing in various forests and jungles. For me, such habitats were places of mystery and fascination ---places I knew held primeval energies, just waiting to alight on some innocent traveler. A scary thought at times. So, when I recently decided to embark on a series of dinosaur paintings, my tree series perked up and imparted a new energy to me as I walked by them hanging on the walls of our home. 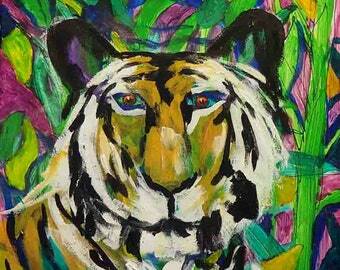 Art does this sort of thing---it can sway thoughts and directions---and excite the heart. 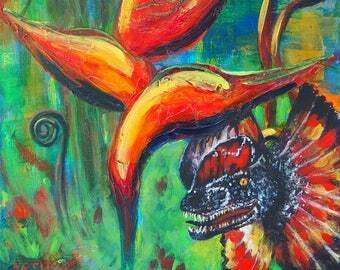 I had no choice---this Eustreptosponoylus dinosaur was going to take a walk in my "Jungle" painting.